"Sadhana is nothing but where one prepares for the day to become kind and compassionate for everyone, including the enemies. so that we can match up with the day, so we can match up with absolute reality. Face the reality with reality. Don’t face the reality with laziness and slowness. If you do so, you will never be successful and then you are your own enemy. You can’t make it. And that’s why sadhana is an act." Sadhana is the daily practice of waking up in the Amrit Vela time (2 1/2 hours before the sun rises) to meditate and chant God’s Name. In the words of Yogi Bhajan, "Sadhana is nothing but where a disciplined one, the love, talks to one’s own soul. It is nothing but where one cleans his own mind." Morning Group Sadhana is a disciplined daily practice that can move one toward self-realization and expanded consciousness. 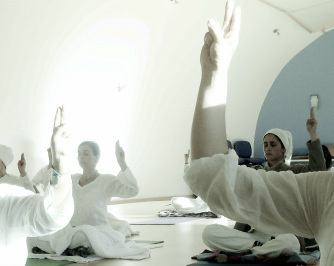 Sadhana begins with a traditional prayer called Japji and is followed by one hour of Kundalini Yoga and then one hour of chanting and meditation. The traditional 3HO Sadhana is in the predawn hours because of the powerful energy and stillness of this time of day. For certification, a minimum of 5 early morning Sadhanas is required and you will be encouraged to attend more as your energy permits. If you're not used to getting up this early, we recommend starting before the course to get your body into this rhythm.